My favorite part of my day on the Studio 9 tour was my whole day because I got to see some amazing art and I experienced stuff that I never knew. I learned that art is everywhere around you and I see art differently since the tour. I enjoyed painting on Father John’s and Jana Botkin’s paintings. I also enjoyed my talk with Shirley and then Aranga gave me a canvas so I can create my own piece of art. Thank you for organizing the Studio Tour 9. I can’t wait for the next Studio Tour. 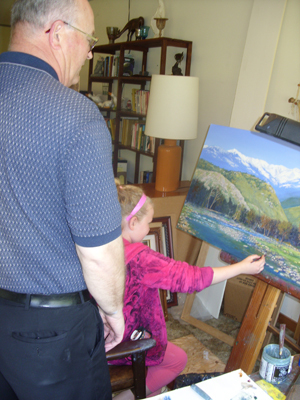 Abigail paints a rock on Father John Griesbach’s painting. 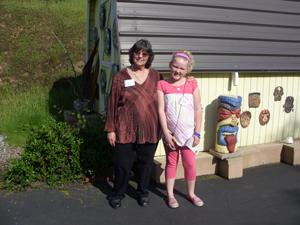 Abigail paints with Jana Botkin………….then meets Shirley Keller at her studio and has a wonderful talk. 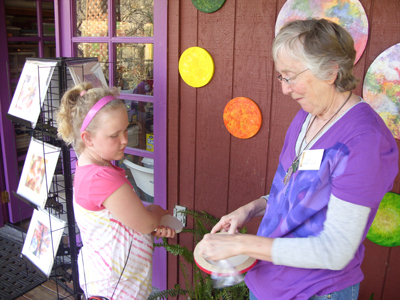 Abigail, with new round canvas in hand, visits with Aranga Firstman. Editor’s note: As both an artist on the Studio Tour and the organizer of it, I love to hear stories like Abigail’s. This intimate and special studio tour affects the lives of visitors in many ways. The sharing of creativity, the courage of it and the process of it, is the core of it. The gift of the Studio Tour extends way beyond its weekend every other year. It is the heart of the Studio Tour. 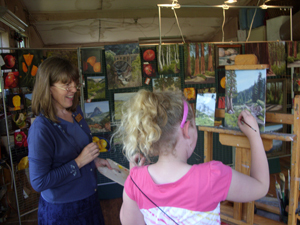 Please send us your Three Rivers Artists’ Studio Tour experiences. We would love to hear from you. We hope to see you at the next Studio Tour in 2012, especially you, Abigail! This entry was posted in Studio Tour Heart and tagged Three Rivers Artists' Studio Tour on March 31, 2010 by Elsah.